The weather here has been amazing these past few days, which to me equals a great day to curl up with a good book (after I enjoyed the outdoors of course). There is something so nice about being able to have the doors and windows open and feel the gentle breeze while you get lost in a great story - in this case Her Secret by Shelley Shepard Gray. 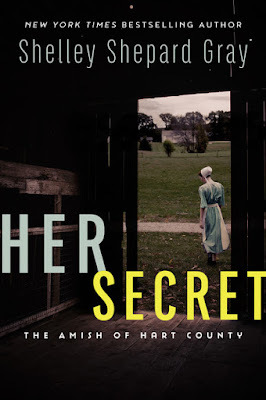 Her Secret is the first in a new Amish series from Shelley Shepard Gray, focused on the Amish of Hart County in Kentucky. This book had a nice balance of suspense mixed in, which was a nice addition to this love story set in the Amish community. The Amish youth have a period in their life when they are allowed to explore their world before committing to join the church, it is referred to as 'running around' or Rumspringa. This period normally begins around the age of 14 to 16 and ends when a youth chooses baptism within the Amish church. It is also commonly the time when they court and look for a spouse. In Her Secret, we find out that it was during her running around that Hannah dates a young Englischer named Trent. It made me wonder, with the conservative life that the Amish leave, are their youth more likely to misjudge the character of a young man than non-Amish youth. I would guess that when someone is being sweet on you, that regardless of your upbringing, there is a tendency to ignore signs that should probably be warnings. The two went on only a few dates and the stalking did not necessarily start right after they stopped seeing each other, but as we later learn (I can't tell you why - you have to read it to find out) there were likely other influences that caused Trent to become jealous and start stalking her. The family moved away to escape the threat of this young man stalking their daughter (turns out that's not the only reason - but again, you will have to read to find out the other reason). They finally started to settle into their new community and begin to make friends, not realizing that the threat is not yet over. This book was captivating, suspenseful and had me hooked from the beginning. The story was filled with characters that are easy to relate to and has the right balance of friends and family, love and suspense. It showed the importance of open communication to keep a family strong and of depending on those around you in times of need. I wanted to keep reading and was a little disappointed when it ended. For now, I will have to wait on future installments in the Amish of Hart County series to keep learning more about they Hilty and Troyer families and how their stories continue to unwind. Learn more about the book and see additional reviews on the Blog Tour Landing Page.